It's such a pretty colour, and I think it will go well in my bathroom which is a pale blue purple colour. I love the paper band, which I think is handmade. The soap comes from 3-Corner Field Farm, another New York State supplier. I am really loving my virtual tour around New York with this swap. It has reminded me that there is more to New York than the City. In fact my other half didn't realise there was a State as well as a City! 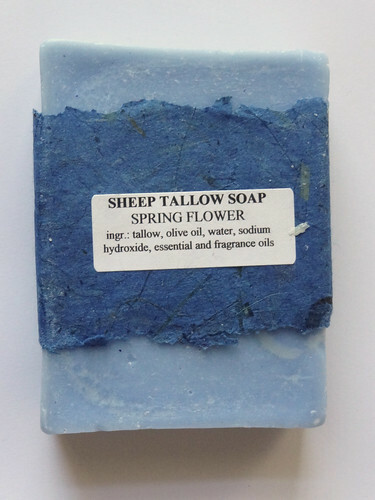 Looking at the photos on the website made me smile to think of the source of my soap. Once I got this package open I worked out why it smelt familiar, it has a very similar smell to a soap from my childhood. It was either Imperial Leather or Pear's, which were the only two soaps we ever used. I don't know which one it was, but the smell of this soap is exactly what having a bath in my house smelt like! I can't believe I only have two more days to go in my Swap, but to cheer me up, my recipient has now received her box of goodies! The unveiling from Paula over at Knit and Seek will be great fun as I find out her reactions to all her gifts. She has only opened one gift so far, so I've got another 6 days of watching the fun. I'm also pleased she took photos of the box with all the wrapped parcels in, because I forgot to take one. I was very proud of my wrapping so I was annoyed with myself for not remembering to take a quick snap, before sealing the box with vast quantities of parcel tape! Paula is someone who has commented on my blog regularly for some time, and I have commented on hers too, so we have got to know each other pretty well over the last year or so. I was delighted when I found out that she was to be my recipient as it was great fun buying/making things for someone I already knew and liked. Come back tomorrow for more unveiling from my box and go and look at Paula's blog, it's very good you know!